When corals are stressed by sedimentation, too much nutrients, toxic chemicals or warmer than normal temperatures the corals can get sick and die. Most hard corals and sea anemones have a brownish coloration resulting from the presence of zooxanthellae (symbiotic microalgae), that live within the coral tissues. When water temperatures get too high, coral polyps lose the symbiotic algae inside them, causing them to turn white, or bleach. Zooxanthelles like all plants use the energy from sunlight to produce sugar through photosynthesis. Without the zooxanthelles the corals die. The dead corals become brittle and soon covered by algaes. If there is a major storm, areas which suffered coral bleaching will also suffer severe damage. Coral bleaching seems to be a generalized stress response of the coral, for example if water temperatures are elevated over a longer period. From temperatures of 29°C on bleaching will occur in some corals, if water temperatures are over 32°C all algaes are expelled. However corals can go into dormant state for about 8 weeks. 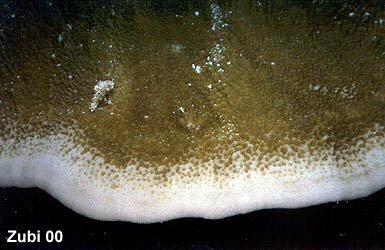 This disease is characterized by a black mat, a few millimeter to a centimeter wide, on the surface of coral tissue, moving across the surface, leaving behind bare white skeleton. This microbial mat is made out of cyanobacteriums. The disease is caused by a bluegreen microalga, Phormidium. White-band disease causes tissue to peel or slough off the skeleton and results in a distinct band or line of bare white skeleton. The cause of this disease remains unknown. Massive and encrusting coral species have been observed to lose their tissues, leaving behind bare white skeleton. The tissue disappears at the rate of one or more centimeter per day. It appears to be highly infectious, possibly caused by a bacterium, and capable of spreading from one coral colony to another. The cause of this disease remains unknown but might be stress-related.